Join us for a special gallery hours event to celebrate Teachers! 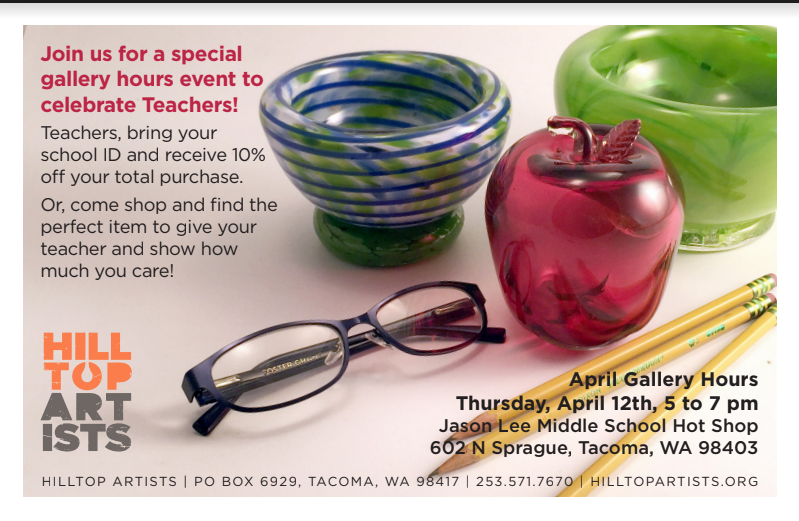 Teacher Appreciation Week is coming right up so be prepared with a beautiful glass apple for your teacher. In addition to some apple-themed items, we will have a selection of items that would make perfect gifts for the teachers in your life. Teachers – bring your School Employee ID and receive 10% off your total purchase. Once per month, we open up the Hilltop Artists gallery for public shopping hours. Come check out our beautiful student-made glass art! We have jewelry, vases, fused glass….you never know what unique treasure you might find as student-made art is always one-of-a-kind. The proceeds from our glass sales go straight back into our programs and help us provide tuition-free glass arts instruction for 650 students each year.